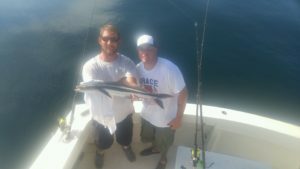 Fishing charters here in Fort Lauderdale are offering action that is much more predictable and steady than our last report. We wish the weather forecasts were a bit more accurate with rain forecast-ed for yesterday and clear mostly skies called for today. Well today is not a post card caliber day as there are numerous showers passing through. I’ll call them showers as thankfully there is no thunder and lightning. Yesterday, forecast to be crummy, was of course sunny, warm and clear. Not a drop of rain. But as we mentioned the fish have been back on track rain or shine. Lots of Kingfish on the reefs. Almost all of ours have been biting Bonito strip baits on the deep brained line planer rods and reels. Any color combination has been fine but the chartreuse and mylar fished on the head of the strip has been the center of attention. 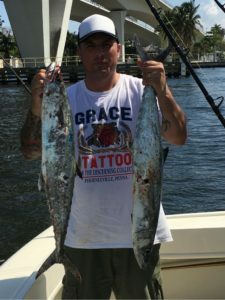 As we said, lots of Kingfish ( Capt. Matt had 14 on a half day), but the less than perfect news is that they are running small. Never the less they are here in good numbers and providing some really good action. The outside main reef has been best, which is in roughly 100 feet of water and only a mile or so off the beach. An attempt to catch a nice plump Warsaw Grouper for our regular angler Anthony instead resulted in the nice plump shark in the lead picture. As we reeled that shark to boat side for pictures and to be released he was followed up by a pair of Cobia (also pictured). 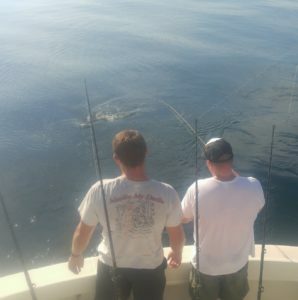 We are always hopeful of that circumstance and we were ready as both Cobia were hooked and landed on live baits pitched to them on spin. The annual madhouse run of fully grown Bonito ( only occasional ones for now) has essentially ended and the big boys have been replaced by numerous schools of the juvenile ones we so love to live bait known as “Flippers” or “Bullets”. Also good numbers of whitefish baits and all sizes of Mullet now. Always good to see an abundance of bait in our area. Good numbers of Snappers in the deeper water of all sizes and varieties. 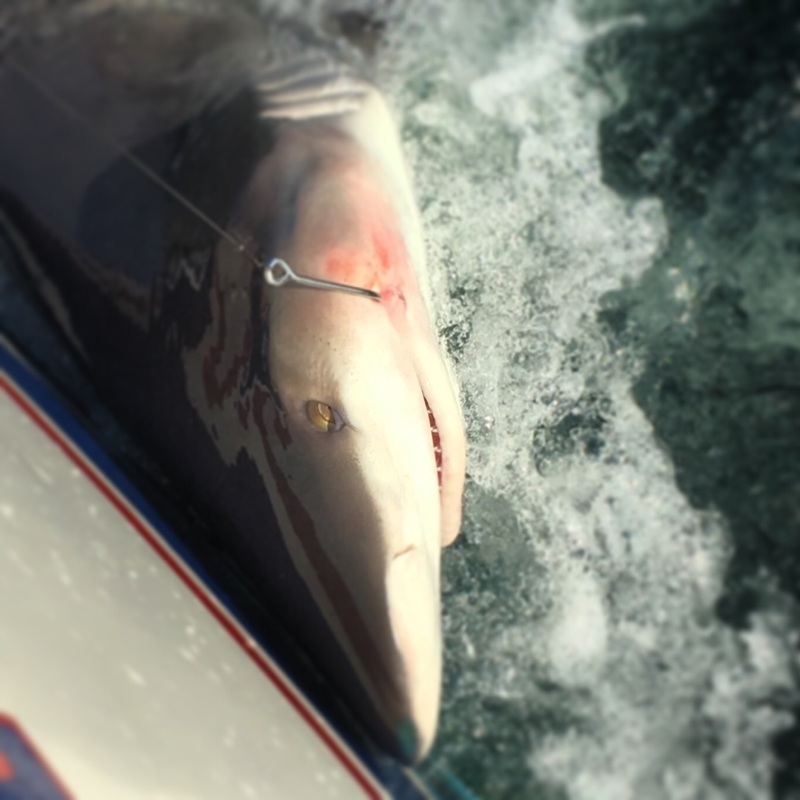 A very light current has allowed us to target them successfully on most days. Tight lines and good fishing. Rick, Matt, TKS and JJ aboard the Marlin My Darlin.